A big thanks to Joe Scherber who watched my plants for me while I was out of town for the last week. Even though I may do a dispute over pumpkins with my wife on national television from time to time, in reality family comes first. Just got back from a great trip to Canada to see my wife's family and then some camping in Waterton and some time in Glacier national park. The pumpkins put on some nice weight while I was gone. Both pumpkins are more than a foot bigger in circumference than my pumpkins last year and both pumpkins last year were personal bests. No complaints where things are at right now. The 868 had one concern this evening however. A tiny bit of sap was coming from the blossom end. It was a clear, gel like substance. In that area I wiped it down with a solution of 50% bleach and the put a little sulfur powder on it. Gave both plants a touch of fish & seaweed along with some calcium. As I've mentioned before, June and July are a lot of work in pumpkin growing. The vines grow like crazy and it can be a little exhausting burying vines and taking care of the plants. I'm not sure how growers with more than 4 plants do it. Right now we are to the fun time. Most of the vines on both plants are terminated so you just get to watch the pumpkins grow and this time of the year they grow a lot. Pictured to the right is the 1204 Scherber. Doesn't show well in this photo but it is starting to orange up. It is going to be a nice looking pumpkin I believe. 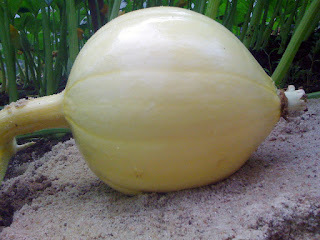 Today I spent some time putting down some more sand for the pumpkin to grow on and positioning the pumpkin on the vine. 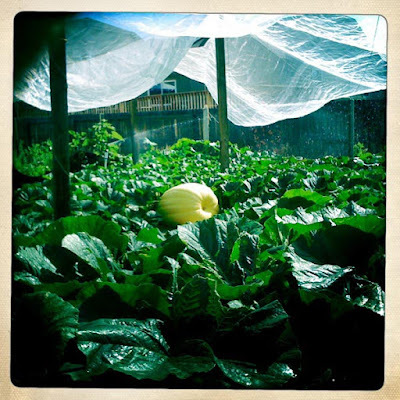 As the pumpkin grows out it can start pressing against the main vine so about this time of the year you've got to get it positioned perpendicular to the main vine or else you run into problems when the pumpkin gets to big to move. This morning I gave the plants some humic acid, calcium, magnesium, molasses and and a touch of alfalfa meal. This evening I will give it some fish & seaweed as a foliar application. My kids plant has a pollination on it now. 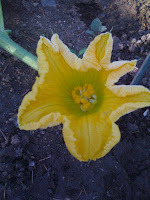 On Tuesday it was pollinated. It seems to have taken so hopefully this next week it will take off growing. 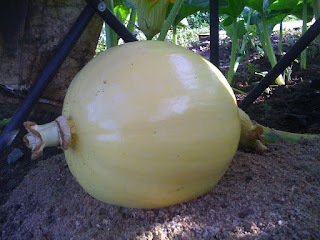 Both pumpkins set new growing records today putting on 7 inches of circumference growth in a 24 hour period. I don't recall ever having a pumpkin do that before. I gave both plants some compost tea this evening with worm castings, alfalfa pellets, humic acid and molasses in the mixture. Must have reached 100 degrees in the pumpkin patch today. I ran the water like crazy and it seemed to have paid off. The 1204 ("Ricky") put on 6 inches today in circumference growth. Lovein that! Gave the plants some calcium, fish & seaweed this evening. The next three weeks can be some of the most fun of the entire pumpkin growing season. Competition giant pumpkin growing is all about hope. You hope for a good seed, good weather and good luck. After working with salad for four months now is finally the time of the pumpkins. Vine growth slows down a lot right now (after crazy vine growth for two weeks very little growth on the vines today) as the plant's energy gets focused on the fruit. 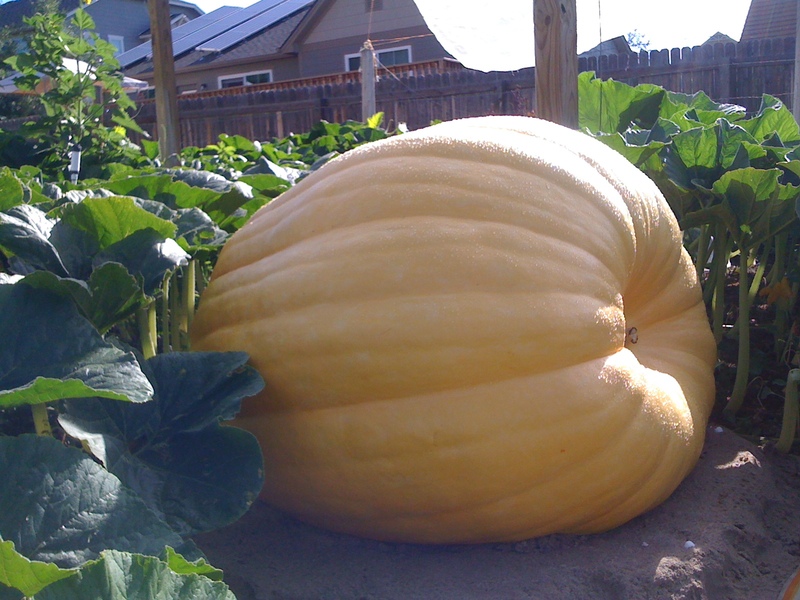 At about 21 days after pollination the pumpkins typically take off putting on 20 to 40 pounds a day. At about day 30 you find out if your pumpkin has a chance of being a player or not. At about day 60 your hope is gone unless you have a really big one going, but the last 30 days of growth is comparatively small to the previous 45 days. Both of my plants this year have hope. They are healthy, they've shown the ability to grow vigorously, they have good size, the vines are buried better then I've ever buried the vines before, the soil was prepared relatively well going into the season (I've never seen so many worms in my patch--started out with zero) and the pumpkins have very good genetic backgrounds. Depending on the day I can't decide which pumpkin is going to be bigger. Initially I would have said the 1204 (aka "Ricky") was going to be king of the patch. Now, at the ripe old age of 12 days, the 868 pumpkin (aka "Jerry") has shown me some interesting stuff. Which one is going to be bigger? Well, the scale won't lie in September and it is a long ways to go between here and there. As the saying goes, "The BS stops when the tail gate drops." I gave the plants some compost tea this evening along with a side dressing of compost next to some of the newer vines. Also added a new sprinkler so I can do a better job of misting the plants during the heat of the day. It was hot today in Colorado and it is going to be hot for the next 5 days at least. Got some rain again this evening. I think that makes it about 12 straight days that we have had rain. Today is the first day in about 10 or 11 days the we didn't cloud up. Full sun and almost not a cloud in the sky. I think we hit about 91 degrees in the pumpkin patch today. Actually had to mist the plants 5 or 6 times today. The new leaves couldn't figure out what the big, bright ball of gas was in the sky. They had never seen it before. This evening I gave the plants some CalCarb to help with the heat stress. It is going to be back to warm again for the next week or so. Today it has been 10 days since I pollinated the 868 Johnson (AKA Ricky) pumpkin plant. The 10 day mark is the day that you are usually clear from the pumpkin aborting. The measurement on this pumpkin was the biggest I've ever had before on a 10 day measurment. The plant is very impressive. I might have gotten everything I wanted by putting that 1544 Revier into my 1161 Rodonis last year. Another 72 days 21 hours and 11 minutes or so and we will know for sure. Both plants are within 100 square feet of taking up all of their allotted space. By the end of next week I anticipate having all of the vines terminated except for the main vine on the 868 pumpkin plant. The cocktail of fertilizers that I gave the plants yesterday seems to have done the trick. The leaves were back to a nice green color again even after more rain last night. I don't know how growers who have 6 Atlantic Giant pumpkin plants keep up with them this time of year unless they are retired or dentists (he, he, he). I only have my two plants and I can't keep up with the weeds and vines on these things. As mentioned before, both plants have been very aggressive growers lately with all of the rain and I got behind on burying the vines because of all of the mud. the last few days I've been burying vines and I still haven't got them all buried. I know the difference between the men and the boys this time of year so I just say to myself, "What is Barry, Gary, Joe, Pete, Gary, Marc, Ron, Jim and all of the rest of the RMGVG growers doing right now?" and then I start throwing some more dirt on the vines. It can be exhausting though. I'm sure 12 years from now they will find me lying dead in the patch from a coronary. Not a bad way to go, but it will probably be the year that I finally break the state record which will be a bummer. This evening I sprayed 1 cup of fish & seaweed with some manganese on both plants (in a light rain) and then two hours later I sprayed 2 tablespoons of blood meal on both plants. I think a lot of nitrogen has leached from the soil so I'm trying to get it back up to par. This morning I went out to check on the pumpkin plants after some big rain last night. The patch drains fairly well so there wasn't any standing water but the ground is saturated. All of the new leaves were lime green this morning. That tells me that the plants have met their limit for water and lack of sun. Fortunately it look like we are going to get into a dry, warm pattern in Denver for a couple of days after today. I gave the plants some foliar magnesium, calcium, a touch of humic acid and sugar to help with the photosynthesis. Tomorrow evening I may give the plants a little blood meal if they haven't greened up because I'm concerned that the nitrogen has leached out of the soil after all of this rain. More rain in Denver today with more coming in the forcast. After the last rain storm I sprayed down the plants in Actinovate. Actinovate is is a biological fungicide that can kill fungus that grow on the leaves and in the soil. With all of the rain we have been getting that is more of concern now. The rain has also brought on another type of invasion. The weeds have been out of control. I spent about 45 minutes pulling weeds this evening and I still haven't got them all. The pumpkins and pumpkin plants have been growing like weeds too. The pumpkin on the 1204 plant is the biggest I've ever had at this point of the season and although too young to tell the 868 plant's pumpkin has been putting on some good gains too. I've got to get out and bury the vines however. Many of the vines have grown 4 feet in the last 6 days and I need to get them in the ground. If the patch isn't too muddy tomorrow morning I'll do that. All of this rain has got me reconsidering how much I need to water the pumpkin plants. Even with the additional water I've been putting down this year I'm beginning to think I need to do more. For the 5th day in a row we have had big rain in Denver. The plants haven't minded it since the hail netting has stopped the hail. Monsoonal flows from the southwest are bringing in warm, moist air into Colorado, which the plants tend to like. The rain storms in my mind have been atypical because things don't cool down as much as usual when it rains and the rain has come in bands where it dumps for 15-20 minutes and then the sun pops back out again. The nights have also been about 3-5 degrees warmer at night too. The last two days I've started thinking more about leaf diseases like powdery mildew than I normally would this time of year. In August it is typical to get some powdery mildew but if it gets out of control it can slow down your pumpkin growth and even kill the plant. Throughout the season I give my plants an aerated compost tea to help keep a healthy biology on the leaves and in the soil. An aerated compost tea is just what it sounds like. I take a painters strainer bag and put about 3/4 cup worm castings, along with a leaf or two, some alfalfa meal, molasses and humic acid. That is then placed into a 5 gallon bucket that is full of water that has been sitting for at least 12 hours that has a fish tank hose in it. Attached to the hose is a fish tank air pump that is designed for a 20 gallon fish tank and I have the compost bag suspended in the water above the end of the hose so the air bubbles go up through it. The idea is to build healthy biology (bacteria and fungus) in the water that will be beneficial to the pumpkin plants and soil. By aerating the compost, anaerobic bacteria that are harmful don't develop as much and more beneficial areobic bacteria and fungus blossom. In the end you are pouring a plethora of biology onto the plant which in theory overwhelm the bad stuff in the pumpkin patch, feed the pumpkin plants and give a minimal amount of nutrients. If you get a bad spot on your lawn sometime try pouring some aerated compost tea on that dead spot and then see what happens over the next 5 days. It is amazing the kinds of results that you can get. Tonight I gave the plants some compost tea that I've been brewing for about 2 days. Typically I only brew it for about 24 hours but the rainy weather hasn't allowed me to get into the patch much in the evenings. For the last few months I've been looking high and low for a better form of calcium to put on the pumpkin plants. Ideally what I've been looking for was something that can be applied foliar, is organic, has a descent amout of calcium in it and didn't have a bunch of nitrogen, phosphurous or potassium in it. I think I finally found what I've been looking for with Metalosate Calcium. What I like about Metalosate Calcium from what I have read is that it is organic, has less nitrogen in it than Nutri-Cal (only 2%) and has more calcium in it (18% calcium). The calcium it uses is an amino acid chealate that is supposed to be able to be absorbed via foliar application. More interesting is the claim that the metalosate calcium has the ability to move in the phloem of plants. The calcium ion in Metalosate Calcium is bonded to two amino acids, creating the Metalosate Calcium molecule. The plant is supposed to recognizes the molecule as a proteinaceous molecule allowing it to travel in the phloem instead of forcing it to use the xylem route which means it can move quickly and move into the fruit. Some studies I have read sounded interesting. Foliar applications of Metalosate Calcium increased the calcium content in grapes by 400 ppm more than foliar applications of calcium nitrate. More calcium in a pumpkin potentially means a fruit that doesn't split open. I gave the plants a small dose of Metalosate Calcium this evening. I guess at the end of the season we might find out if it is going to make any difference but it is worth a try. Like I've talked about before, growing big pumpkins in Denver is not easy. There is an area called the orange belt, that runs from Boston through the mid-west to Oregon where giant pumpkins tend to grow best. That line doesn't go through Denver. Cool nights, sometimes hot days, high UV rays and low humidity slows up growth in our climate. To make up for that you have to "make them think they are in Iowa." That is a favorite quote from one of the most experienced growers in Colorado. To do this I've got hail netting over my plants not only to protect them from hail (and they have had a workout this last week) but also to protect the plants from the sun. Anything over about 90 degrees and photosynthesis starts slowing down in a pumpkin plant and the plant has difficulties moving enough water to the big leaves fast enough to keep up with evaporation. My hail netting shades the plant with about a 14% shade block which reduces the UV rays hitting the leaves, cools the plant slightly and protects the plants from the elements. I also mist the plants throughout the heat of the day to get the humidity up and cool the leaves down. The last few days the pumpkin plants have thought they were in Iowa. An early monsoonal flow into Colorado has brought higher humidity, big but short rains and warmer temperatures. My plants have reacted positively to it all. I don't remember the vines ever growing faster when there were pumpkins on the vine. I'm trying to hold off on terminating the vines right now because there is a lot of energy stored up in those water laden vines and if it doesn't have anywhere to go you can run into problems. My challenge is that I'm starting to run out of space on the sides of the patch and the vines need to be terminated very soon. The picture of the plant is my 868 Johnson plant. I love the look of the leaf canopy on this plant. The leaves are shorter so they don't get caught in the wind quite as much but it is hard to get even watering under the leaves however. 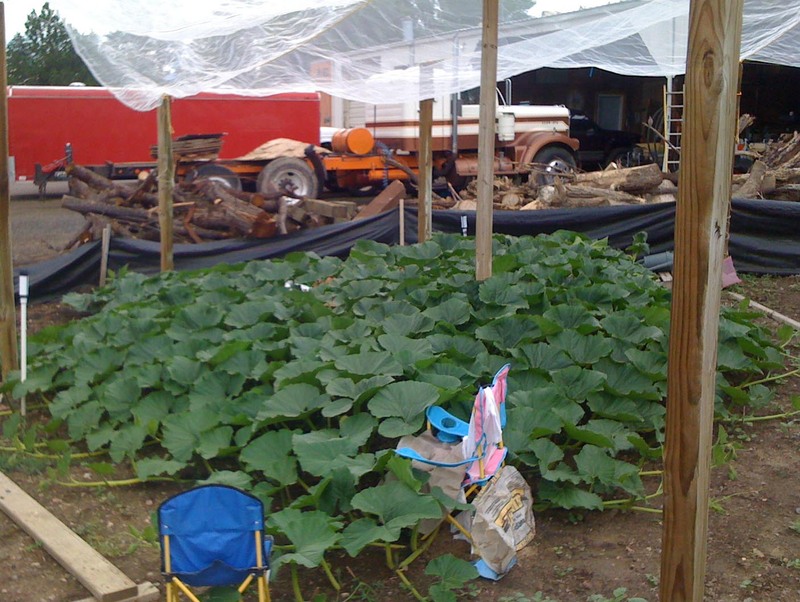 The chairs in the picture are covering recently pollinated pumpkins to keep them cool and dry. Gave the plants about 1/2 cup of gypsum each today. The circumference measurement on the 1204 Scherber today was 22 inches. That is an inch bigger than any other pumpkin I have ever grown. Unfortuneatly it doesn't mean anything. 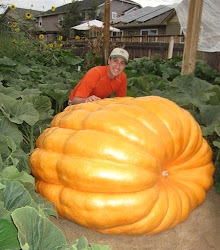 The world record 1,725 pound pumpkin had a 10 day measurement of just 17 inches and it turned out all right. However, I would take a bigger 10 day measurement than a smaller one any time. After the 1 1/2 inches of rain we got yesterday it is going to be interesting to see what the pumpkins are going to do. The vines are growing like crazy right now. I for one like the theories that Russ Landry put out the beginning of this year (view article here) in regards to calcium movement in the pumpkin plant, blossom end splits and low fruit weight. I saw the impact last year that a lack of water and the inability of the plant to absorb calcium can cause on the fruit. If you are interested take the time to read the article. To help build the pathways for calcium and nutrient movement within the pumpkin I have been giving the plant a fair amount of calcium these last three weeks. I don't know how much is to much but I don't want to be to low like last year. This evening I gave the pumpkin plants a touch of Nutri-Cal, calcium chloride, CalCarb, humic acid and seaweed. The seaweed was thrown into the mix because I read a study this week done on grape vines that found that giving the plants some potassium right after giving it calcium caused a significant increase in the absorption of calcium. The Auxins in seaweed also has an effect on cell elongation which can improve growth. Pollinated the 868 Johnson today with the 1725 Harp this morning. At this moment it is 98 degrees in the pumpkin patch so today I've been testing how much water is too much. I figure if I'm going to get this born on the 4th of July pollination to take then it is going to take lots of water and cooling down to make it happen. I've got a container of ice next to the newly pollinated female flower and the flower is covered with a chair to shade it. 10 days from now we will know it if worked. The pumpkins on this plant seem to be leaning towards the 1544 Revier side, which in my book is a good thing other than the apple shape. If I don't get a wheel shaped pumpkin I'll be in good shape. The pumpkins are definetly going to be orange and probably a dark orange color. The 1204 Scherber hasn't aborted and is still growing which is great. Very hot in Denver today and the forecast is for even hotter weather tomorrow. For some reason I only pollinate when it is over 95 degrees (which of course isn't ideal) so tomorrow the 868 female is going to open of course. The clone plants didn't have any males that were going to open tomorrow so I'll be pollinating the 868 with the 1725 Harp. The pollen comes from Joe Scherber and his 1725 plant (seed from the former world record pumpkin) is a gorgeous plant with a nice sized pumpkin growing on it that looks like it could be a contender. Gave the plants some CalCarb this evening with some humic acid and calcium chloride added to the foliar spray. CalCarb seems to help the plants with heat stress and there will be a lot of that tomorrow. I read a study two weeks ago that said that the absorption of micronized calcium is much higher when it is mixed with humic acid so I have been doing that lately. Gave the plants some more Biotamax this morning. This will probably be the last dose for the season. Previously I posted about a test I did with Biotamax on the lawn. The test was inconclusive in term of results, but over a month later I am seeing the lawn greening up in the front and the back in ways I haven't seen for three years. I can't say it was Biotamax that brought on the results but it isn't hurting and it is probably beneficial when used as part of an entire program. After spraying down the pumpkin patch with Biotamax using a hose end sprayer I sprayed down the leaves of the plants because some growers have said they have seen some leaf burn after using Biotamax. Not sure why that would be the case and it may not be true but no reason to take chances. Over the last week I've started terminating vines on both plants as they reach the back edge of the patch. You terminate a vine be cutting off the leaf mass that is at the end of vine. After removing the mass the vine won't grow any more. Gave the plants some compost tea this evening. Looks like we will be pollinating the 868 plant on the 4th. American's birthday and hopefull the b-day of a new personal best pumpkin. Here is my first pumpkin picture from the patch this year. 4 days old. I'm hoping this little thing will be over 1,000 pounds and at the weigh-off at the end of September. If it doesn't abort this one will be called Ricky (aka Gervais).